The NADS simulation center is best known for its high-fidelity ground vehicle driving simulator, NADS-1. 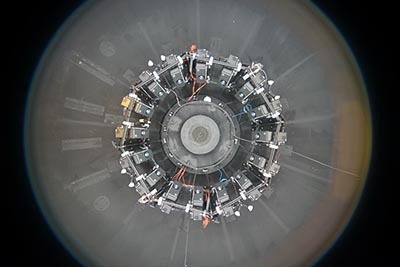 The NADS-1 utilizes an actual vehicle cab and projects scenery 360 degrees around the driver on the interior walls of the dome that houses the cab. 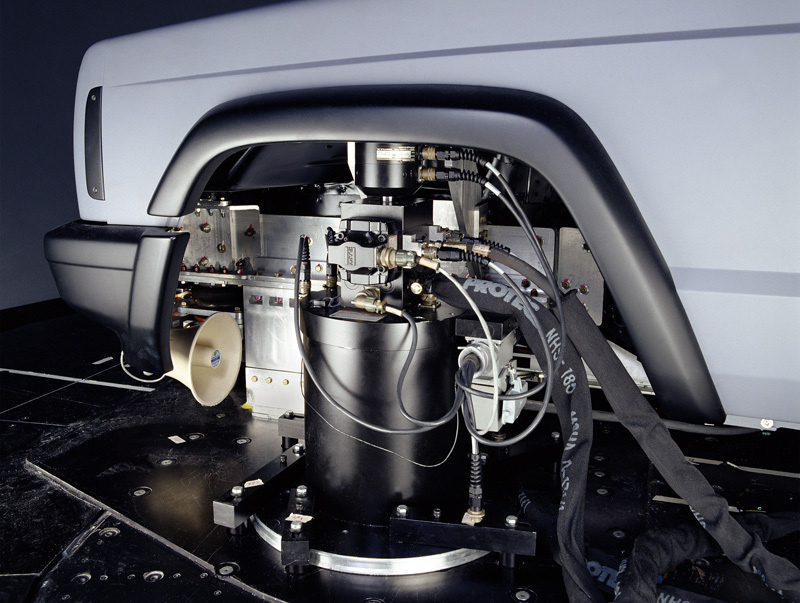 The vehicle cab is mounted on 4 independent actuators that provide vibration associated with driving on varying road surfaces. The entire dome is mounted on motion base that can independently provide yaw, roll, pitch, turning, lateral and longitudinal cues to the driver. All in all, the NADS-1 has a 13 degree-of-freedom motion base resulting in the largest motion envelope of any driving simulator in the United States and 2nd largest in the world. More importantly, the combined motion, graphics, audio, control feel and software systems on the NADS-1 reproduce the closest experience to driving an actual vehicle. The motion system’s unique capabilities set it apart from other simulators, thus enabling NADS-1 to accurately reproduce motion cues for sustained acceleration and braking maneuvers, movement across multiple lanes of traffic, and interaction with varying road surfaces. Realistic reproduction of these combined maneuvers is not possible in fixed-base or limited lateral movement simulators. 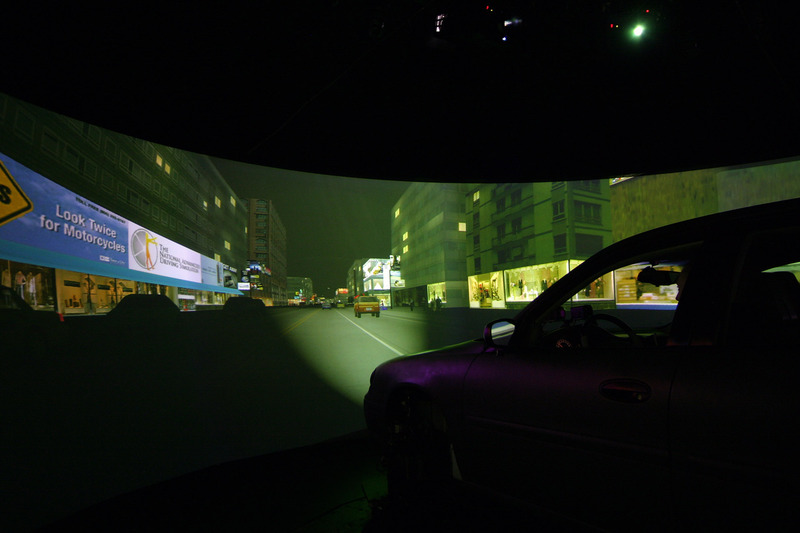 Motion cues for NADS-1 are correlated with other sensory stimuli, providing the highest fidelity real-time driving experience in a simulated environment. The 24 foot NADS-1 dome has enough space to house full-size vehicles cabs which can be swapped in and out of the dome. The current collection of vehicle cabs include a passenger sedan, a mid-sized sports utility vehicle, a heavy truck semi cab and an agricultural tractor cab. 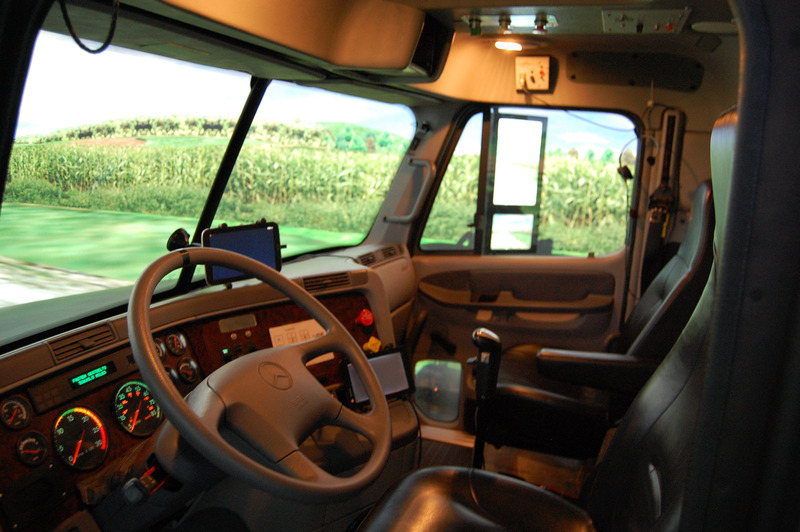 Each cab is instrumented to respond to driver inputs and provide feedback that replicates driving the vehicle on a real road. Accelerator and brake pedals utilize software-controlled electrical motors to provide feedback, thus allowing unlimited flexibility in programming specific pedal feedback mechanisms. 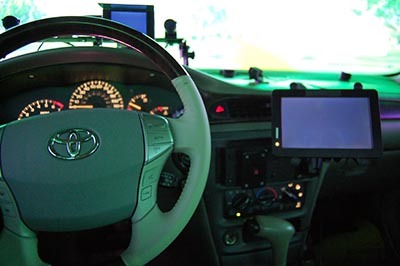 The steering wheel is similarly designed to allow customized steering response to each vehicle type. All dashboard indicators are operational, and the majority of control switches are instrumented. 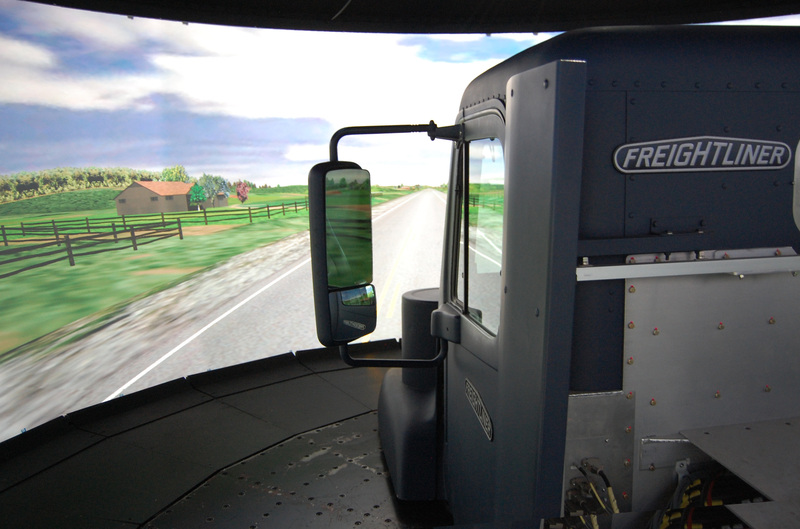 Multiple in-vehicle cameras provide customized views of the cab environment. The cabs include eye-tracking, head tracking and seat posture sensing systems that provide data on driver performance and comfort. Optional secondary task displays can be installed to vary driver workload. The steering wheel, pedals and seat also have the ability to provide haptic feedback to simulate warning systems. The NADS-1 displays graphics by using sixteen (16) high-definition (1920x1200) LED (light emitting diode) projectors. These projectors display seamless imagery on the interior walls of the dome resulting in a 360 degree horizontal and 40 degree vertical field of view (1.3 arc-min/pixel horizontal and 1.7 arc-min/pixel vertical). 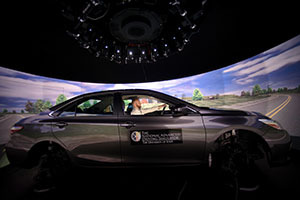 The driver feels immersed as a result of seeing projected scenery through the windshield, side windows, rear window, rear view mirror and side view mirrors. LED projectors provide rich saturated colors that result in more realistic traffic signals, signs and more accurate reproduction of day and night time driving environments. LED projectors with dimming technology are particularly well suited to display low-contrast objects in low-light and night time driving environments. 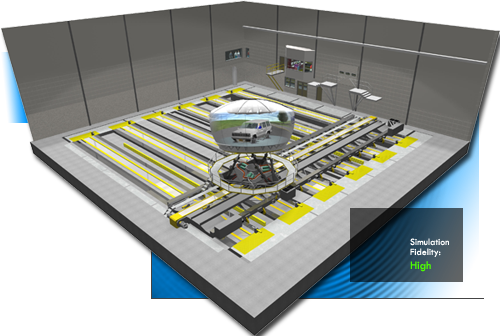 The visual system also features a custom-built IG (Image Generator) system that’s capable of generating graphics for 20 channels (16 for the dome and 4 additional for task-specific displays). Custom software also performs warping and blending of the image to present a seamless continuous image on the walls of the dome. All of the simulators at NADS, including the NADS-1, utilize an existing library of realistic driving environments for urban, suburban, interstate and rural driving areas in day and night-time driving conditions. We also the have the ability to model new areas or provide geo-specific replicas of actual world locations. The audio system provides sounds that emulate wind, tire, engine, and other vehicle noise, as well as special effects such as tire blowouts that are correlated with the dynamic behavior of the vehicle. Additional sounds produced by surrounding traffic are blended with the ambient sounds to produce an immersive experience. The NADS-1 features an open architecture where different sub-systems communicate with each other using a published interface on a dedicated high-speed network. This flexible architecture allows for integration of 3rd party hardware and software systems. Engineers at NADS also have access to source code for all of the University-owned simulator software and actively manage and make updates to this software to support research and sponsor needs. Lower fidelity simulation can be used for preparation and development of scenarios or study protocols without incurring the cost of high-fidelity simulation platforms. 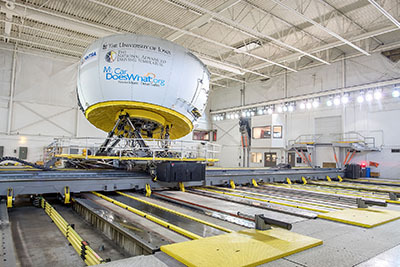 Lower fidelity simulation is also ideal for new driver training where full immersion is not necessary.